We couldn't fit everyone in to the Woking Theatre, so we just picked up some more tickets for the brilliant Yvvone Arnaud Theatre panto!- Here are Gordon & Ann, with PG from Eagle Radio, who will be starring in Jack & The Beanstalk! TWO very special people visited Guildford’s Yvonne Arnaud Theatre this week: Gordon and Ann Parris were Mayor and Mayoress of the Borough of Surrey Heath from May 1995 to May 1996 and founded the Children with Special Needs Foundation with the help from their friends, many of whom went on to become committee members. The focal aim of the charity is to provide help to local children with special needs, and to support their families, schools and clubs. 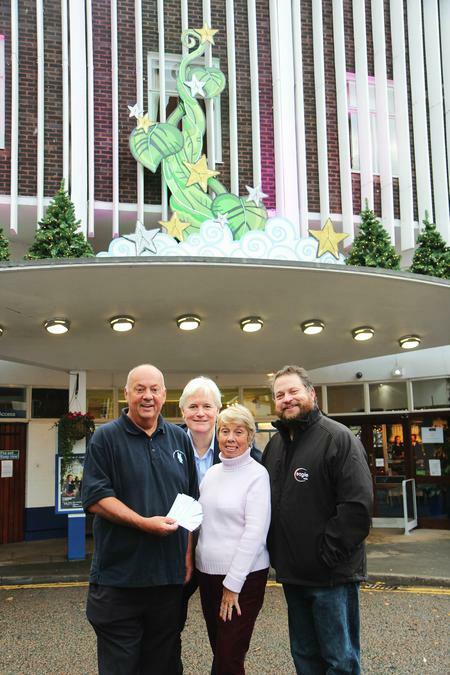 One of those patrons is Eagle Radio’s Peter Gordon, who is also performing in the pantomime Jack and the Beanstalk at the Yvonne Arnaud Theatre this Christmas, and Gordon and Ann have, once again, organised to bring 50 children along to enjoy the show. Peter explains: “Over the best part of two decades CWSNF has funded hundreds and hundreds of projects and individuals across Surrey and the surrounding area, who perhaps otherwise wouldn't have had the support in such an important and challenging sector of our society. “For Gordon and Ann it’s been a mission and I think those of us that have joined in, it has been an absolute pleasure to make sure that we can help raise as much money for CSWNF as we possibly can. Gordon and Ann’s aim has always been to ‘put a smile on tomorrow, today’ and 20 years and millions of pounds on they remain true to that ethos.